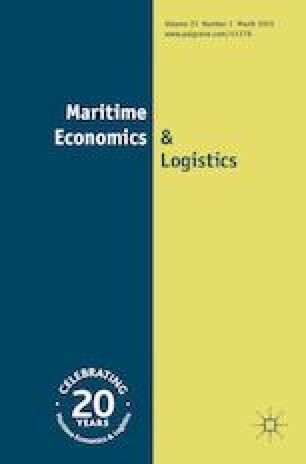 The objective of this study is to deduce the comparative level of external costs per transported trailer within a context where an existing freight transport chain is replaced by one that includes greater use of shipping. Using both Sweden’s national guidelines for cost–benefit analysis (ASEK) and the European guidelines (Ricardo), the external costs of two alternative options are evaluated. The external costs for a road and shipping option are estimated to be lower than for the direct shipping option under Swedish guidelines, but higher under the European guidelines. However, the results favour the road and shipping option in preference to the direct shipping option under both Swedish and European guidelines when internalizing taxes and fees are accounted for. This is the case even where the shipping mode is compliant with the most stringent environmental regulations. The paper concludes that the evaluation system employed can have a fundamental impact on the outcome of a CBA and that the Swedish guidelines (ASEK) could by improved by incorporating specific values for air pollution from ships (particularly NOx emissions) and a system for regularly updating emission factors. The authors are grateful to Sweden’s East Coast Ports Coalition for funding this study. For valuable comments received on an earlier version of the paper, thanks are due to Katarina Händel (Swedish Maritime Administration), Gunnel Bångman (Swedish Transport Administration), Henrik Swahn (HSAB) and Mattias Haraldsson (VTI – The Swedish National Road and Transport Research Institute). The authors would also like to thank Rune Karlsson at the VTI (for the use of Figs. 1 and 2), as well as the Editor-in-Chief of the journal, Prof. Hercules Haralambides, and anonymous reviewers, for providing valuable feedback on an earlier version of the paper. The conclusions and recommendations expressed in the paper remain the authors alone and do not necessarily reflect the opinions of the VTI as an authority. DieselNet. 2017. Emission standards. Heavy-duty diesel truck and bus engines. http://www.dieselnet.com/standards/eu/hd.php, accessed 10/09/17. Kystverket. 2017. Kystverkets veileder for tilskudd til overføring av gods fra veg til sjø. http://kystverket.no/link/68d44d9f645f4d4b83c3e9ccc9cfb726.aspx. Accessed 05 Sept 17. NTM. 2016. NTM Calc 4.0. https://www.transportmeasures.org/ntmcalc/v4/basic/index.html#/. Accessed 10 Apr 2017. Resa-mellan.se. 2017. Truck distance and fuel calculator. http://www.resa-mellan.se/. Accessed 4 Sept 2017. Sea-distances.org. 2017. Sea distance calculator. https://sea-distances.org/. Accessed 04 Sept 2017. Sjöfartsverket. 2017. Fairway Dues. http://www.sjofartsverket.se/en/About-us/Finances/Fairway-Dues/. Accessed 04 Sept 2017. SåCalc. 2015. Verktyg från Sveriges Åkeriföretag. Årlig körsträcka för lastbil. http://www.akeri.se/transportindex/sacalc-basic. Accessed 04 Sept 2017. Trafikanalys. 2017. Eco-bonus för sjöfart: slutredovisning, Rapport 2017:11, Stcokholm: Trafikanalys. http://www.trafa.se/globalassets/rapporter/2017/rapport-2017_11-ecobonus-for-sjofart—slutredovisning.pdf. Accessed 14 Sept 2017. U.K. Department for Transport. 2015. Guide to the Waterborne Freight Grant scheme. https://www.gov.uk/government/publications/waterborne-freight-grantscheme-guide-2015-to-2020. Accessed 09 Apr 2017. Unifeeder. 2015. Vessels and vessel tracking. http://www.unifeeder.com. Accessed 17 Apr 2017.